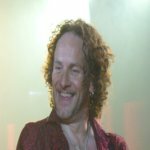 Def Leppard guitarist Vivian Campbell was interviewed by 102.3 WBAB radio last week and a transcript is available plus audio. Vivian says the band will definitely tour in summer 2014 and start recording new songs in January. Vivian talked about his health/lack of hair, playing the residency/summer tour while doing chemo, Last In Line, the Las Vegas residency, Ded Flatbird setlist and the name origin, his new solo album, new Def Leppard music, a summer tour in 2014 and returning the Vegas for a second residency - heavily hinting again at Pyromania. The full 16 minute audio can be heard via the link below. "I am working on a solo record as well and I don't know when that's gonna come out. That's kind of a slow project but I'm writing a lot of songs." "But more importantly I mean Def Leppard need to put out some new music. You know we're so long overdue coming out with something new. We're actually embarrassed about it. I just was with Rick Allen and Phil Collen yesterday and we were talking about it at dinner last night. So we're excited about that. We're gonna actually start recording some new Leppard music in January. But like I say it's long overdue. So yeah there's a lot of stuff going on you know we try to keep busy." "We are gonna tour next summer for sure yeah. We'll be back." "It's a definite plan. We're gonna record in January. I don't think there's anyway we'd have a new album done in time for a summer tour. But we could at least knock out a song or two before a summer tour." "So yeah in January we're getting together and we're gonna write something and get it out there." "Yeah actually we had such a great experience in Vegas the whole thing was really great for us. I think it's fair to say that the promoters there enjoyed having us and yeah there's been talk about having us back. I don't think that would be next year obviously but it's certainly something we're gonna do again yeah. I think we will yes. So no prizes for guessing which one will be next."